Dr. Peter C. Gøtzsche is the head of the Nordic Cochrane Center. His book, "Deadly Medicines and Organised Crime" was published last year. Peter is speaking here at PsykoVision's conference on The Psychiatric Epidemic in Copenhagen." "Pre-school children are being prescribed drugs such as ritalin for hyperactivity, contrary to NICE guidelines, warn child psychologists who say under-funding of child services is to blame. Researchers found more than a fifth (22%) of educational psychologists were aware of pre-school children taking stimulant medications – despite NICE guidelines saying children under five should not be prescribed them. The staff surveyed said pressures on child and adolescent mental health services (CAMHS) meant children were not being properly assessed, and there was a rush to treat attention deficit hyperactivity disorder (ADHD) with medications rather than trying psychological interventions first, as NICE advises. ‘Our biggest difficulty is that CAMHS and paediatric teams are so short staffed they go straight to medication and completely ignore NICE guidance,’ a DECP briefing said. The survey also found educational psychologists felt that ‘intolerance of difference’ and ‘medical models of childhood’ were influencing how children’s learning and behaviour are viewed. The briefing was produced in preparation for the DECP’s annual conference being held in early January, when the DECP ‘medicalisation working group’ will publish a position paper and professional practice guidelines on the diagnosis and management of ADHD. It comes after Pulse found GPs were struggling to refer children with behavioural or emotional problems for proper assessment at CAMHS following cuts to child mental health budgets, amid plans to make even further cutbacks." 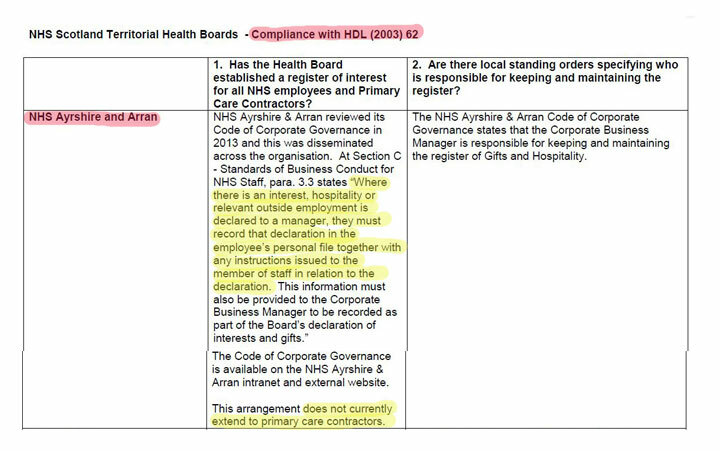 In July 2013 I had a most helpful response from Andrew Jackson on behalf of NHS Grampian in terms of my question (that I put to all Scottish NHS Boards) about a publicly accessible Register of Interests for ALL staff. 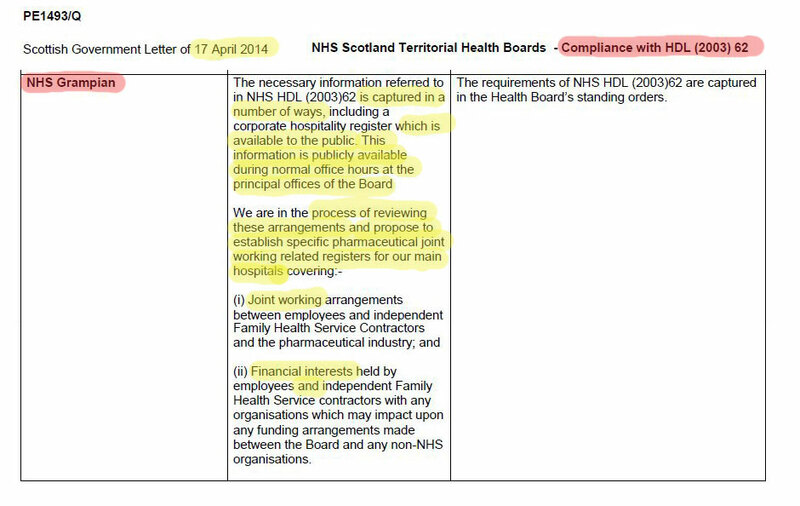 I would be interested in hearing how NHS Grampian are progressing with this, 18 months on from my original FOI enquiry. As a reminder, I append below, Scottish Government Circular HDL (2003) 62 and what it asks of Chief Executives. 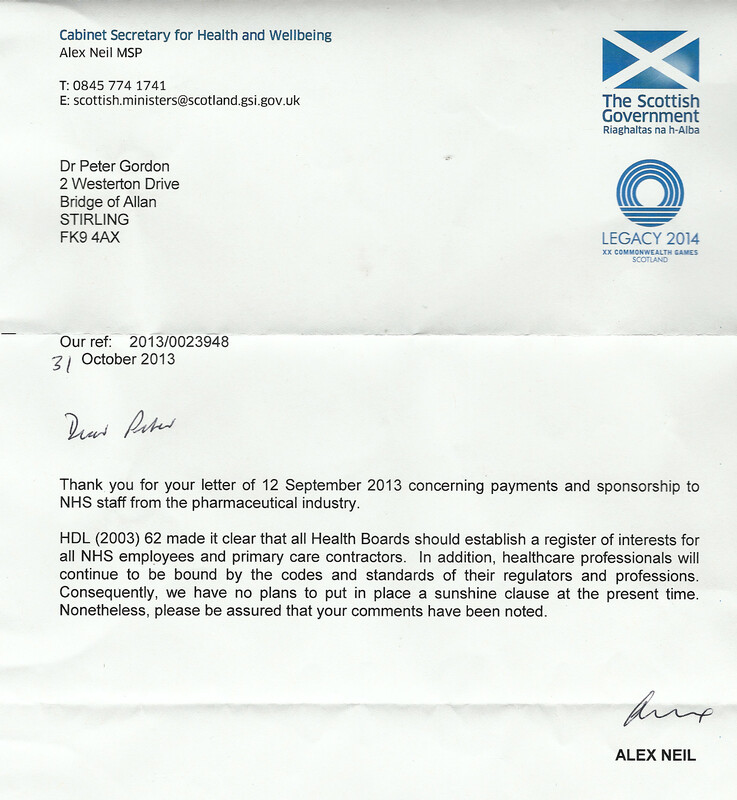 In April 2013 I wrote to NHS Ayrshire & Arran about Registers of Interest for ALL staff. In a written reply, dated 31 May 2013, I was told by Ann Catherine Wilson “There are no payments from pharmaceutical companies on the register of interests.” This was stated in relation to a link to Board Members Registers of Interest. 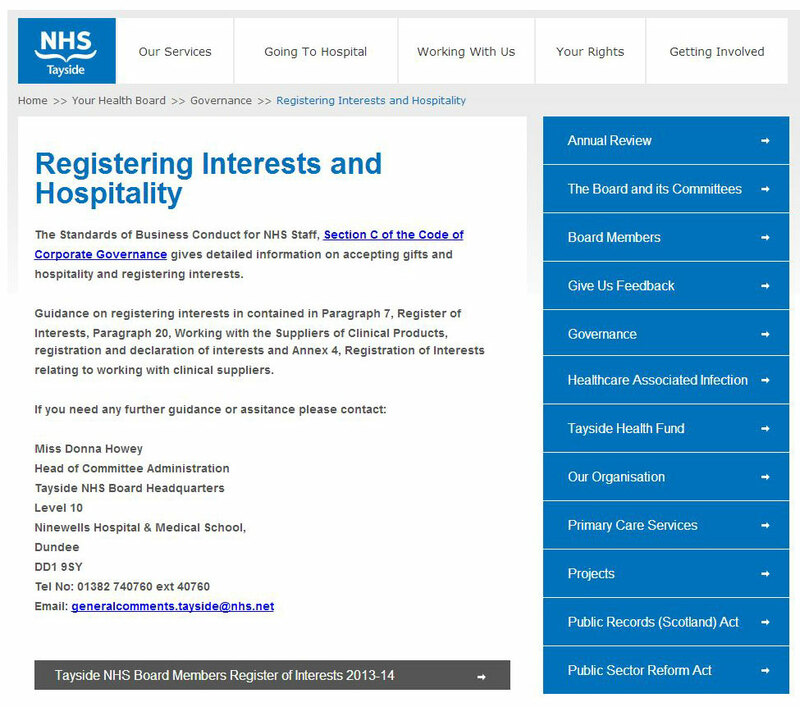 I wrote back to NHS Ayrshire & Arran, pointing out that this Register was for Board members only. *Appended below is HDL(2003) 62 and what the Scottish Government asked of Chief Executives." "This is the Fourteenth in the Persecution Series, after The Persecution of Heretics, The Persecution of Vulnerable Adults, Harassment from the BBC to GMC, Harassment from Rolf Harris to James Coyne to Doctor Who, Persecution: Black Riders in the Shire & Persecution: Rumbles from Mordor, and eight in the SUI Cide Series SUI Cide in Betsi, SUI Cide Trick or Treat , The SUI Cide Note & SUI Cide or Homicide, SUI Cide in the OK Corral. SUI Cide & Peace in our Time, The SUI Cide Apparatus. A new subseries, the Pharma series begins next week." "For some of us, the magic of boarding an Alaskan Airlines flight from Anchorage to Atlanta with 200 other people and all their baggage, or even bigger planes aiming at crossing 12000 miles of Pacific Ocean, and finding that the thing actually lifts off the ground never fades. Any sane thinking person should be reduced to a state of gibbering panic for the duration of the flight, but most of us put our trust in the woman at the controls and in the fact that if we don’t get there she won’t. If she had significant concerns she wouldn’t now be taking off. While aviation safety systems aren’t perfect, if the near misses or other glitches she and her colleagues report aren’t taken care of, no one gets anywhere until the problem is sorted because she won’t fly." "Almost by definition then a good doctor has to be someone who knows when not to poison or mutilate or someone who, when things go wrong, can quickly respond with “what do you know, we gave you a poison and you’ve been poisoned, let’s see if between us we can work out where to go from here”." "Psychiatry is the Sister who has got to the Ball first time after time and got her man. But this time the Prince seems completely uninterested. The options – suicide with a glass sliver or turn into an Ugly Sister? If not one of these two options, psychiatry has to achieve another first. Its task is not, as the current President of the Royal College of Psychiatrists in Britain would have it, to get more psychiatry to people. Its task is to get to a position where people recognizing a real benefit might in a truly voluntary manner seek out psychiatric input. It has to find if there is anything about it, other than its police function, that can’t be provided by a good primary care generalist or a psychotherapist. It has to find true love." "We don’t want every psychiatrist to go down with the ship and retire from practice or commit suicide if a patient commits suicide or to take into their care the patient with an autistic spectrum disorder born to a mother he has put on an antidepressant while pregnant, but we don’t want Korean ship captains either ..."
"Over a year has passed since I had an uncomfortable experience at work through trying to encourage transparency regarding pharmaceutical sponsored medical education. 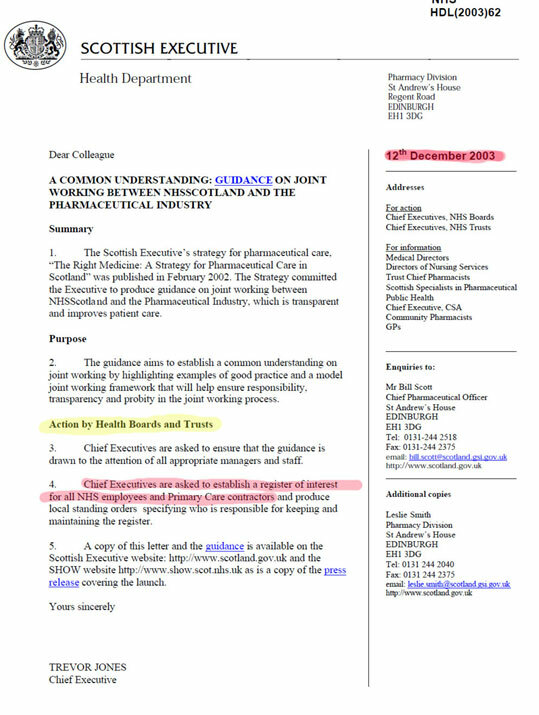 The following sponsored education was circulated in August 2013 by a senior medical manager of NHS Forth Valley to medical staff. I posted the flyer on the pinterest board as I have done with all other examples of sponsored medical education that came my way." "A few weeks later I received a letter from the senior medical manager concerned that formally expressed concerns that my “behaviour” had been “offensive and unprofessional”. This letter was also sent to more Senior Managers and as a result I was summoned to a meeting and encouraged to “reflect on my behaviour”. I have reflected at length about my experience. I remain puzzled by the degree of defensiveness generated simply by recording sponsored medical education. I am also disappointed in how unwelcome my efforts to achieve transparency have seemed to be to my colleagues."